Andrew Brown wrote Covenant and Schism. 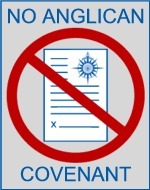 There may be some good reasons for the Church of England to sign up to the Covenant. But the bishop of Croydon’s are absurd. 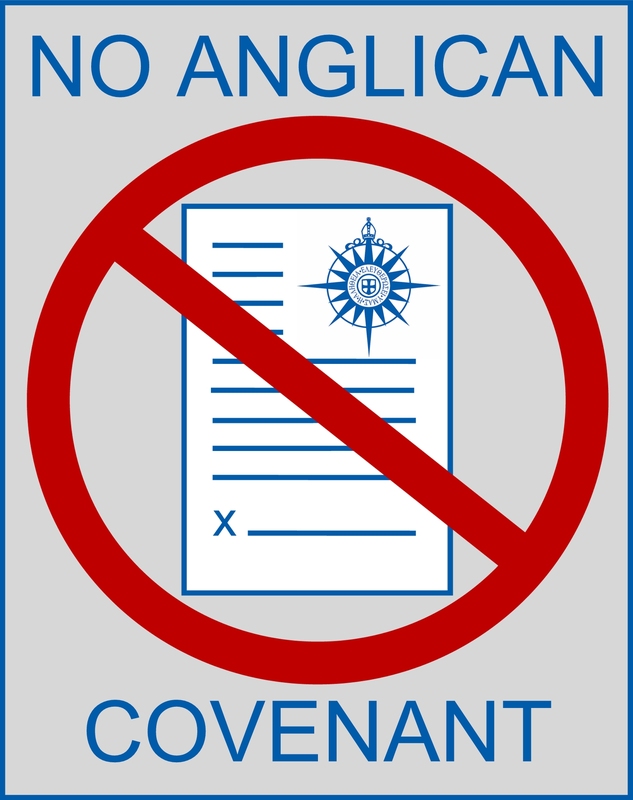 Lionel Deimel wrote No Anglican Covenant. He has even produced a logo for this, in small and large sizes. Mark Harris and the ACI have been holding a dialogue. First, ACI wrote Communion And Hierarchy. Then Mark wrote Why direct diocesan sign-on now to the Covenant is a bad idea. The ACI felt it necessary to respond to this, with More On Communion And Hierarchy. Mark Harris responded again with Followup on Communion and Hierarchy, my article “Why direct sign on..,” etc. I posted Lionel’s emblem on my blog. Thank you, Lionel. Make that a double! THANK YOU, Lionel and Mimi! …or to put it another way, Fr Ron, what diocesan bishop would tolerate parishes in his/her diocese making a “covenant” with the bishop of another diocese (that could give the slightest pause of to whom said parishes ultimately were responsible)? (*) Except in extremely *limited* ways, e.g., can’t decide to send more than their canonically allotted share of (voting) representatives to the Anglican Consultative Council. One reason why the pro-covenant side don’t take seriously the provisions against cross-border raids: after the covenant is signed, the provinces outside it will become officially partes infideli — so planting churches there is just evangelism., Of course, that’s what they think already, but the covenant will regularise their case. It’s local politics, folks – only local. Indeed, if being Anglican means being in communion with Canterbury, the act of refusing to receive Holy Communion from the ABC because of the presence of others at the rail would seem to be an important act. But it seems to have been overlooked. Can anyone get Rowan Williams to read Letter from a Birmingham Jail? Please? It says all that needs to be said about why this Covenant is wrong.